Be the first to share your favorite memory, photo or story of Margaret Jeanne . This memorial page is dedicated for family, friends and future generations to celebrate the life of their loved one. 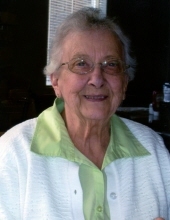 Jeanne passed away peacefully the morning of January 27, 2019 at the Covenant Care Holy Cross Manor at the age of 93. Mom was born on May 24, 1925 to Joseph & Edna Harbison on a homestead south of Botha, AB. She was the youngest of six children. She was so proud of her Irish heritage and was often heard saying “I’m Irish, you know”. It thrilled her that she was able to visit Ireland in 1996 with her daughter Belle, especially County Down in Northern Ireland, where her dad was from before coming to Canada in the late 1800’s and then heading west, being one of the first cattle ranchers to settle East of the Red Deer River. Prior to meeting her husband, Harvey, Mom had a successful career as a bank tellar at the Alberta Treasury Branches in Stettler, Grand Prairie & Calgary. She particularly loved curling and, in fact, played in the Alberta Women’s Championships. She also enjoyed spending time at her family’s cabin (“SOOTSUS”) at Buffalo Lake. In the 1940’s, she and her sister, Mary, took a “road trip” in her brand new Studebaker down to Boston to visit relatives. She often talked about this trip and how much fun they had. Mom met our Dad in 1954 at a barn dance southwest of High River, where Dad was playing the piano and accordian in an old-time band. They were married on July 30, 1955. After marrying, Mom and Dad farmed northwest of Cayley, then moved to Pultney and then on to Milo where Dad was an Alberta Wheat Pool Operator. They also owned the “Cottonwood Ranch” west of High River, along the Highwood. There they took great pleasure in hosting many fun-filled times with family and friends. In 1967, Mom and Dad moved to High River where Mom balanced working at the CIBC and raising 3 children. In 1973, Mom and Dad bought Nanton Insurance and Realty and enjoyed running this business together until they retired and moved to the farm east of Cayley. During their retirement, Mom and Dad enjoyed fishing at Chain Lakes and Lake Kookanusa. They also made trips down to the Maritimes and into the U.S.
After Dad’s passing in 1994, Mom sold the farm and moved back to High River where she benefitted from the company of many of her friends. Eventually she moved into the Medicine Tree Manor where she resided until the devastating flood of June 2013 when she was evacuated from the Manor and relocated to Calgary. During this difficult time, Mom missed her High River, Nanton, Milo area friends tremendously. No matter where they lived, Mom and Dad met life-long friends and had wonderful memories of each town. Jeanne is survived by her son Ray and his wife Cathy (Calgary), daughter Belle and her husband Ken Johnston (Calgary), and daughter Susan and her husband Tim Hudema (Bragg Creek). She is also survived by her granddaughter Cayla Chaffee and her grandsons Joe Johnston and Tom Johnston. She is also survived by her step-daughter Linda and her husband Wayne Spencer, and her step-son Roy Chaffee and his wife Lana, and all their families, as well as many nephews and nieces and countless friends she made through the years. Mom was predeceased by her husband Harvey in 1994, her parents Joseph and Edna Harbison, brothers Dave Harbison and his wife Ann, Joe Harbison and his wife Audrey, sisters Josephine and her husband Chester Sorenson, Mary and her husband Keith Seibert and Betty and her husband Lloyd Hart. The family wishes to thank Dr. Van Rooi and the wonderful caregivers and staff at the Covenant Care Holy Cross Manor for taking exceptional care of Mom over the last few years. We also wish to thank family members and friends who took the time to visit mom while she was in Calgary. She truly appreciated those visits. Cremation has taken place. A memorial service will be held at a future date, perhaps in the Spring. Donations in Mom’s name can be made to Covenant Care Holy Cross Manor, 70 Evanspark Manor NW, Calgary, AB T3P 0B1. To send flowers or a remembrance gift to the family of Margaret Jeanne Victoria Chaffee (Calgary), please visit our Tribute Store. Donations may be made in Jeanne's memory to Covenant Care Holy Cross Manor. "Email Address" would like to share the life celebration of Margaret Jeanne Victoria Chaffee (Calgary). Click on the "link" to go to share a favorite memory or leave a condolence message for the family.